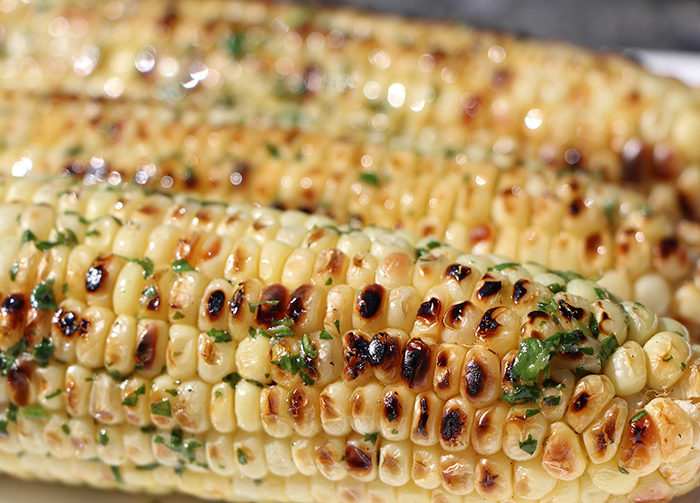 The sweetness of the fresh corn on the cob is enhanced by grilling and the cilantro, lime butter really kicks up the flavors here! Preheat grill to medium high. While grill is heating, combine half of the chopped cilantro, butter, lime zest and salt in a medium-mixing bowl. Cut the lime in half and squeeze one half of the lime into the mixing bowl with the butter. Using a rubber spatula, mix thoroughly to combine all of the ingredients. You can use a small food processor here too-just pulse to combine the ingredients. Taste and adjust the seasoning with salt and lime juice-or both if needed. Don’t be shy with the lime juice as it really stands up to the sweetness of the corn and butter. Transfer the compound butter to a small bowl and pop in the fridge to let the butter harden slightly. Grill corn, turning corn a quarter turn every two minutes or so until cooked through and the corn is charred in spots. About 8-10 minutes. Keep the lid on when done turning the corn. Remove from the grill and serves hot with the compound butter.